Ken Murray, radio comedian, and Kenny Baker, popular network vocalist will be starred in three special programs to be broadcast at 6:15 P.M. Tuesday, 8:45 A.M. Thursday and 9 P.M. Friday under the sponsorship of the United Drug Company. In addition to the comedian and singer, the programs will include the music of David Breekman's Orchestra and the voices of Jimmy Wallington and Harlow Wilcox. The programs are titled Rexall Parade Of Stars. Murray and Baker will engage in comedy dialog. Wallington will serve as master of ceremonies, and Wilcox will present the commercial announcements. Baker will sing currently popular songs on each program. Childs' Cut-Rate Drug store is to present Rexall's "Parade of Stars," the new fall series of radio programs, over station WDLP, beginning Sunday, November 2nd, at 12:45 p.m., and followed at this same time on Tuesday, November 4th, Thursday, November 6th, and Saturday, November 8th. Rexall's "Parade of Stars" is worthy of more than passing attention, quarter-hour, comedy-laden revues boast soe of Hollywood's and radio's finest talent. Among the headliners on the show, are Meredith Willson and his orchestra of 22 pieces. A musician, composer and distinct radio personality, Willson has achieved national prominence for his fine handling of the musical end of many of the best network shows, the latest being the Fannie Brice program. This summer he was featured guest conductor on the Ford Summer Hour and also contributed a first-ranking number to the Hit Parade--"You and I." Kenny Baker, one of America's favorite singing stars. Two seasons on the Jack Benny program made Kenny Baker not only a popular tenor, it also produced a comedian to be reckoned with. Seasons with Fred Allen and in pictures have enhanced that popularity. Kenny baker brings both his voice and his comic ability to these Rexall Revues. Ken Murray: vaudeville, radio and Hollywood all rate Ken Murray as a top-notch comedian. With his unique style and sure touch, no laughs escape this famous and fast working laugh-smith. Harlow Wilcox: well-known and well-liked as the personable announcer of the Fibber McGee and Molly show. Harlow Wilcox serves in a similar capacity on Rexall's "Parade of Stars," at the same time doing his part to emcee the program and appear as the famous Rexall Man. WRJN will broadcast Rexall's "Parade of Stars" next week. Glay Clay and the Casa Loma orchestra, Tony Martin, the Radio Rogues and other stars will be heard four times: Tuesday at at 7:30 p.m., Thursday at 11:45 a.m., Friday at 10:45 a.m., and Saturday at 11:45 a.m.
Last week, we promised to tell you a little more about those Rexall programs, so here goes. Tomorrow (Thursday) morning at 9:45, you'll hear the Rexall Parade of Stars, which is exactly what the title implies. On the program you'll hear music by Rudy Vallee and his orchestra, Ken Murray, the madcap of laughter featured on the Texaco program for two years, and also lovely Frances Langford, singer of sweet songs. Don't forget to hear the Rexall Parade of Stars tomorrow morning at 9:45, and Friday evening at 6:45. They're great. 1:45 p.m.--WBBM--Parade of Stars, with Ken Murray, Judy Canova, John Conte, Harlow Wilcox, and Meredith Willson's orchestra. 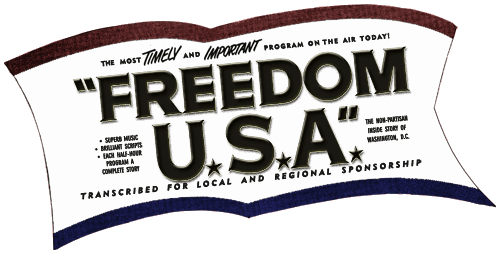 The best things in life are free and that includes the music, the mirth and the all-around merriment on the new "Parade of Stars," a series of four quarter-hour programs starring Ken Murray over Station KFYR Sunday at 4:45 p.m.; Tuesday at 9 a.m.; Thursday at 9 a.m. and Saturday at 10 a.m. As up-to-the-minute as tomorrow's headlines, Ken Murray paces a revue crammed with topical tunes, smart stores and top-notch talent.